The Edo delegate challenged the census figures of Northern Nigeria. A mild uproar broke out at the National Conference on Wednesday following a threat by former Assistant Inspector-General of Police, AIG, Ibrahim Ahmed, to arrest a delegate from Edo State, Chris Agbonwanegbe, for challenging the census figure of Northern Nigeria. Mr. Agbonwanegbe, who was contributing to the report of the Conference Committee on Political Restructuring and Forms of Government, had challenged the census figures bandied by states in the North. He called on delegates to address the injustice that led to the creation of more states and local governments in the North as against what is obtainable in the South. Mr. Agbonwanegbe made a specific reference to the disparity in the number of local governments in Kano and Lagos states. He argued that while Lagos has the highest number of people in Nigeria, it has only 20 local government areas, while Kano with a lower population has 44. As the Edo delegate was addressing the Conference, his Northern counterparts shouted and rebuked him for daring to challenge the population of Kano. But Mr. Agbonwanegbe stood his ground and insisted that sustainable development would continue to elude the country if steps are not taken to conduct reliable census to gather data for national planning and development. He, however, lamented that Nigeria does not have the capacity to conduct a free and credible census, and suggested that the United Nations, UN, be invited to conduct census for the country. He noted that if the UN is allowed to conduct a credible census, the country would have correct figures that would finally put the long years of population disparity to rest. Mr. Agbonwanegbe said, “I did my National Youth Service Corps, NYSC, programme in the North. So, I know what I saw during my service years. I can authoritatively tell you that there is injustice in this country. “How can a state like Katsina or Kano have more local government areas than Lagos which has the highest population? It is obvious that there is injustice and this should be addressed. Mr. Agbonwanegbe’s submission did not go down well with many delegates from the North who almost threw caution to the wind in a bid to stop him from speaking further on the matter. While the Northern delegates screamed and raised a point of order to stop the Edo delegate from continuing to speak, Conference Chairman, Idris Kutigi, ignored them. Mr. Ahmed remained on his feet shouting, thereby polarizing the Conference along Northern and Southern lines. While the delegates raved and ranted, another Kano delegate, Junaid Mohammed, went and met with Mr. Agbonwanegbe and two of them walked out of the chamber, holding hands and talking. 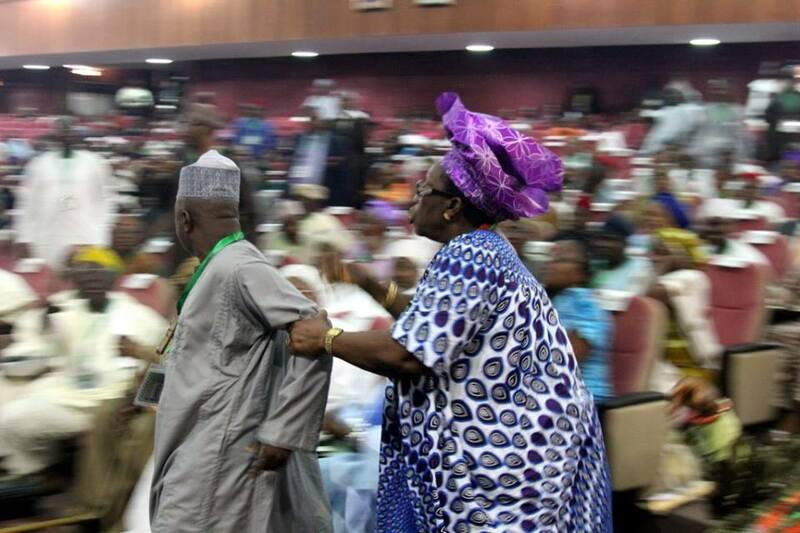 As the duo were leaving the chamber, some Northern delegates castigated Mr. Kutigi for refusing to stop the Edo delegate from challenging the population of Kano State. Not long after, former governor of Ogun State, Segun Osoba, re-echoed the position of Mr. Agbonwanegbe and called for the reversal of the injustice he said characterized the number of local government councils in some parts of the country. Mr. Osoba drew attention to Lagos State, which he said contributes more than 80 per cent to the nation’s Value Added Tax, VAT, yet does not have the required number of local government areas unlike states in the North.